Pretzel Logic's Market Charts and Analysis: Downside Targets Captured: Where Next? 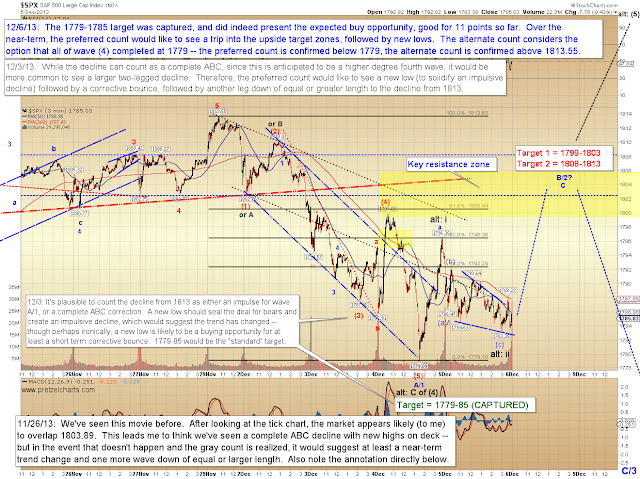 Downside Targets Captured: Where Next? 1. Near-term, I expect higher prices. 2. 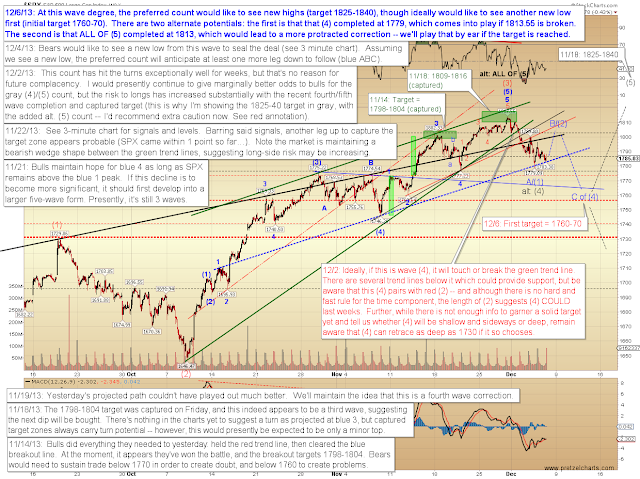 I presently expect that bounce will be sold to new swing lows, though the alternate count allows the possibility that all of wave (4) is complete. 3. The larger trend is still up. Let's start with the 30-minute S&P 500 (SPX) chart to get our bearings. Ideally, I'd still like to see a trip into the 1825-1840 target zone -- however, I'd prefer to see new lows before that happens. 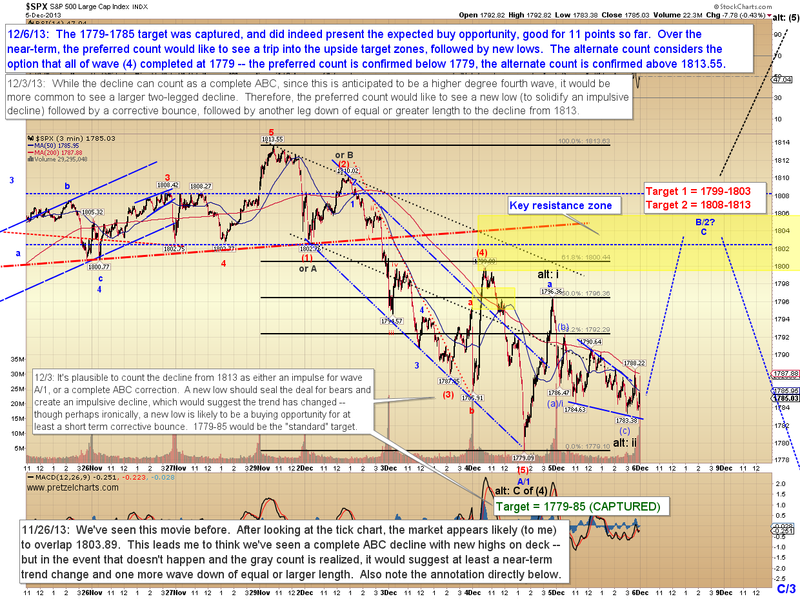 That said, the market has already captured the minimum downside targets for the expected fourth wave. 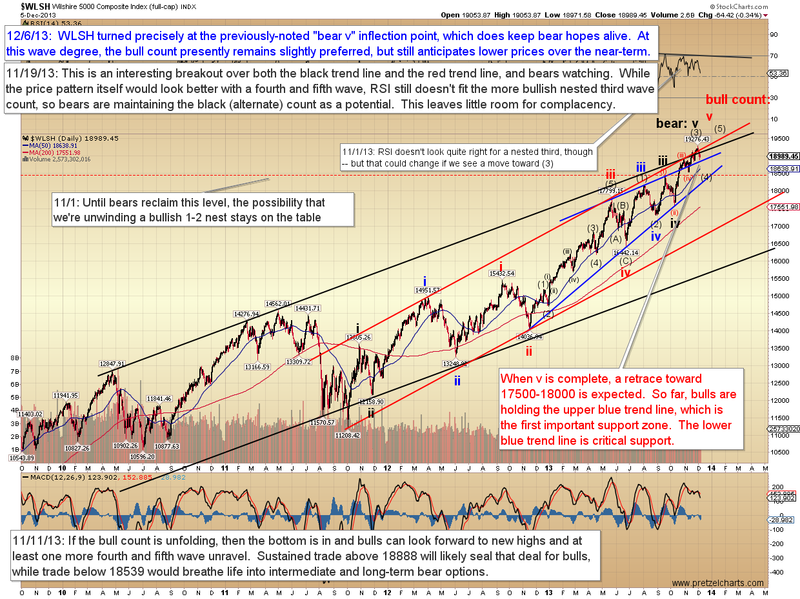 Near-term, I expect a bounce from the cash market. Longer-term, I've again chosen the Wilshire 5000 (WLSH) for discussion purposes. It is worth noting that the position of black "bear v" hasn't moved since it was annotated -- which was weeks before the recent turn occurred. Since reality has now performed in line with that potential, we must at least continue to consider it as a viable possibility. We're way ahead of the game here (and this market hasn't even broken the upper blue trend line yet, so there's nothing terribly bearish in the action so far), but I should at least mention that in the event that the recent peak did mark the end of v, then this correction will last months. That's a warning, which we'll update as appropriate -- however, given what's in the charts so far, we have to continue to give the benefit of the doubt to the established trend, which is up. In conclusion, the long-term trend remains up, but the recent decline probably counts a bit better as an impulse wave, which suggests we may see new lows after the near-term rally completes. 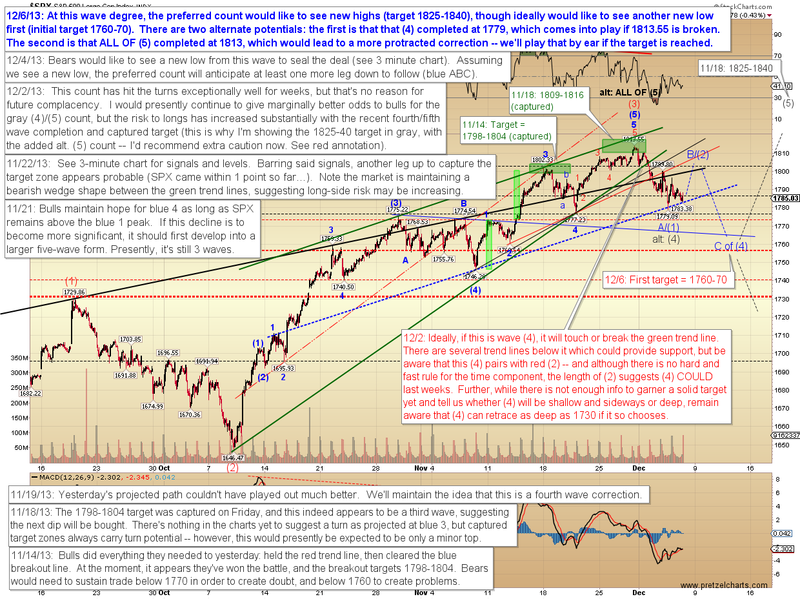 Alternately, trade above 1813.55 would clear SPX for a trip directly into the next target zone. Trade safe.